The Orthodox Church is a Christian Church that traces its roots back to the apostles. You may not have heard too much about us because we are Eastern Christians, which means most of our churches were located in Eastern Europe, Egypt, and beyond. Immigrants brought Orthodox Christianity to the United States with them. As a matter of fact, if you were to go to a country like Greece, Romania, Bulgaria,Russia, Egypt, or Palestine, you would find an Orthodox Churches practically everywhere! Here in the USA we’ve been growing slowly and quietly for over two hundred years. The first Orthodox Churches in the “New World” were actually established in Alaska and down the West Coast by Russian traders before the Louisiana Purchase. Because our Church came to America with immigrants, each community is traditionally linked to one of the Orthodox “Mother Countries.” When you see a Greek Orthodox church or Russian Orthodox, or Bulgarian Orthodox, or even a Coptic Orthodox church, you know we all believe the same things and have basically the same traditions and patterns, but enjoy diverse ethnic heritages. In the fifth century, the Church was divided by understandings of who Christ is; the Nestorians failed to appreciate Jesus’ full divinity, while the Orientals under appreciated his full humanity. We and the Catholics parted ways over issues of culture and papal power in 1054 AD. But Orthodox Christianity is much more than a chapter from Christian history, it is a vibrant Christian tradition that preserves and is shaped by a unique understanding of who God is and how we should live as sons and daughters of God. We hope you enjoy your visit with us! We believe that the Bible contains the divinely inspired message of salvation. As a matter of fact, we are proud that the New Testament every Christian uses today was collected and organized by our Church! In the first few centuries after Christ there were literally hundreds of books about Jesus and his teachings. While some of the books were full of divine truth, some caused problems because their message contained errors or stories that were really peripheral to the faith. So in the last decade of the fourth century, St. Athanasios, who was the Bishop of Antioch (in Egypt) sent a letter to every Christian leader in the world listing what books were necessary for Christians to hear in Church (back then not everyone could read, and even if they could books had to be copied by hand and were very expensive). His list came to be accepted as the “Canonical Scriptures” accepted and used by every Christian church since then. While we value the Holy Scriptures greatly, we read them with care. Even though they are divinely inspired, they were written by humans who sometimes made mistakes or were unclear on some points. In spite of this, they contain information that is important for knowing God and receiving salvation. The same God the holy authors experienced in their lives is a living and dynamic presence in our Church and our lives today. The Saints are holy women and men that the Orthodox Church honors as family members who continue to live with God although they have died here on earth. St. Luke, St. Paul and St. John the Revelator call all Christians “saints” which in Greek literally means “not of the world” (agios).Even though all baptized believers are saints, some receive special recognition because they lived exemplary lives of holiness, showed super- human strength in times of tribulation, or spread the Gospel with exceptional zeal. In the Orthodox Church, people naturally remember their brother and sister Christians who were close to the Lord in their earthly life; bishops don’t “make” saints, or even “proclaim” saints, local churches simply remember holy people and their fame spreads even after death. Some saints are credited with miracles, to be sure, but many are humble people who are commemorated because of their quiet faith. It is not uncommon for us to ask other Christians to pray for us, and even though someone has passed from this life, we believe wholeheartedly that they live forever in God’s presence (Jn 11:25, Rom 6:5), so we have no problem asking them to pray for us as well. Not only do saints inspire us in our daily life, they also pray for us “before the awesome judgment seat of Christ.” We would surely not hesitate to “put in a good word” for family and friends, and we believe that the saints do the same for us in their heavenly dwelling place. Almost everyone keeps pictures of their loved ones or of special events in their homes and offices. Many times you can tell what a person thinks is important by which pictures have a place of honor. Archeologists are finding more and more evidence that this has been true even from pre-historic times. The Orthodox Church has always used painted pictures, or icons, to remember important people; tradition holds that St. Luke, who wrote the Gospel and Acts of the Apostles, was the first Christian to paint icons of Jesus and his mother, Mary. If you visit an Orthodox Christian home, you will probably find alongside family photographs icons ofJesus and the saints. If you take a tour of our church building, you will see icons everywhere – small icons on stands and larger icons painted on the walls. 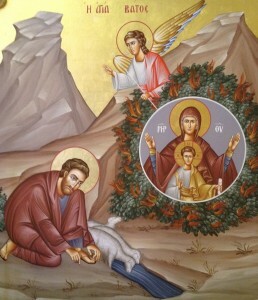 Icons are very important for us in our daily life and in our worship. Sometimes life is so hectic we tend to forget who we are, where our roots are, and sometimes what’s important in our life. 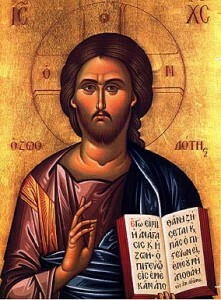 Every time we see an icon we remember our faith, Jesus, and our sisters and brothers in the Lord. Glancing up and seeing one of these holy pictures reminds us of what is really important in life. When we gather for worship in churches decorated with icons we realize that the Church and God’s Kingdom extends far beyond our relatively small group of faithful; believers of all times and places are in God’s presence, praising and worshiping all that God has done for our salvation. Prayer is a mode of being in God’s presence. Of course “prayer” refers to the words that we use when we talk to God in our daily life – whether alone or as a group but it is also our daily lives lived in the presence of God. This is one of the most ancient ways that the Orthodox Church has understood St. Paul’s admonition to “pray without ceasing” (1 Thess 5:17). Even when we are not reciting verbal prayers, we believe that everything we think and do needs to be done before God and to the glory of God. 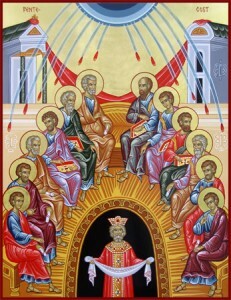 Very simply put, the Orthodox Church believes that God is Father, Son, and Holy Spirit – one in essence and inseparable. But what does that mean? On the one hand, it affirms that God is personal, more than some abstract concept or nebulous energy. On the other hand, God created the universe and all that is in it. God is creator and we are God’s creation. Together, these explain that it is absolutely impossible to know completely who or what God is. Even though I may have known someone all my life, I will never know them 100%. I’m always going to be discovering new things, deepening my relationship with them. Same with God. Every day I live in God’s presence I discover new things and grow ever closer to God. And since God is the ultimate Creator and I am simply a creation, it’s impossible for me to understand completely – or even to experience God fully. At best we can experience and know God’s energies, God’s work in the world. We have experienced God’s loving presence and saving work, so we know God’s out there, but it would be foolishness to think that we are able to figure God out. That’s where faith comes in. We know God created us, that the Son of God came into the world to save us, and that the Holy Spirit of God continues to abide in us and with us. And isn’t that enough for now? Let’s start at the very beginning – in the book of Genesis, God created humans. The Orthodox Church has never taught that this story is scientifically true, only theologically true. Even if the scientific hypotheses are correct and we did evolve into existence, that evolution was part of God’s plan of creation. The theological truth is that God put us here. Gen 1:27 and 5:1 tell us that we were created according to God’s image and likeness. Orthodoxy takes this to mean that every human has the potential to be like God, that we are to recognize and respect God’s image in every person, and that we are to strive daily to grow more and more into God’s likeness. If that weren’t enough, Gen 2:15 tells us that humans were placed in the world “to till it and keep it.” We are caretakers of creation; our job is to watch over it responsibly as God’s custodians. Salvation can be viewed from a positive or negative point of view. In a negative sense we are saved from death and damnation. In a positive sense we are saved to fullness of life and joy. 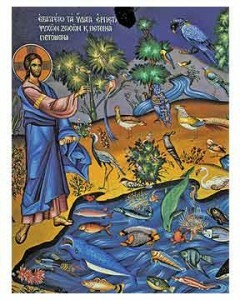 The Orthodox Church traditionally emphasizes the positive. Salvation is the abundant and eternal life Jesus promised so often in the Gospel according to St. John. Salvation is not a one-time event: it is past (Jesus saved us in his life, death, and resurrection), it is present (every day I enter more fully into Christ’s abundant life), and it is future (I await the ultimate salvation of life in God’s heavenly kingdom). 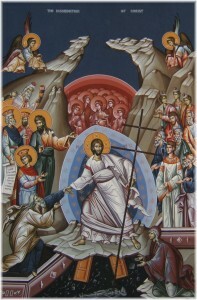 Salvation, for Orthodox Christians, is something that we grow into. Our first, decisive step into salvation comes at baptism, when we are “born of water and the Spirit” (Jn 3:5). In baptism we join and put on Christ (Rom 6:3-5, Gal 3:27), adopted as children of God, able to call God “Father” (Gal 4:5, Rom8:15). We become living temples of the Holy Spirit (1 Cor 6:19). Every day after that we walk in newness of life (Rom 6:4) and progress from glory to glory (2 Cor 3:18). John Klentos, Ph.D. is Associate Professor of Orthodox Christian Studies at the Graduate Theological Union in Berkeley, California. He is affiliated with the Patriarch Athenagoras Orthodox Institute at the Graduate Theological Union.